little salami of pure swine pure, middle grinded, sacked in natural bowel. Red colour, grained well defined with granules of fat, characteristic perfume and delicate taste are the characteristics that make it unique and original. Buy now this product together with Salami Nobile Gentile Casa Modena ca. 450 gr. 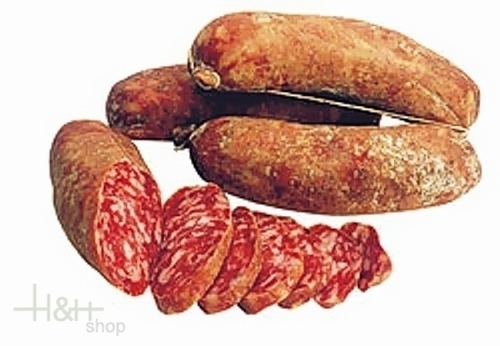 Salami Nobile Gentile Casa Modena ca. 450 gr. ready for shipment: in ca. 5 days Salami Nobile Gentile Casa Modena ca. 450 gr. Pane Carasau is a thin and crisp bread made only Sardinian durum wheat semolina, water and natural yeast. Nothing more. Sardinian shepherds' wives have always been in charge of kneading the dough, shaping it into thin, round discs. As the dough starts to rise it is baked once, then each disc is split in two halves which are re-baked separately. This re-baking procedure is called "carasare" - whence the word "carasau" - and it ensures Pane Carasau the longest durability of all types of bread. Excellent salami. Goes well with bread and wine. Outstanding flavour and delisious taste. Very unexpected! Thank you very much, high quality sausages. It will be the one of our favourite salamis! Very delicious! Very unexpected! Thank you very much, high quality sausages. ..